This house, built in 1904 for Earl E. Barnes, has Classic Revival elements as seen in its flared hip roof, clapboard siding, and porch columns. The stained glass doors and windows, with the Mariposa Lily Design, are an original feature. 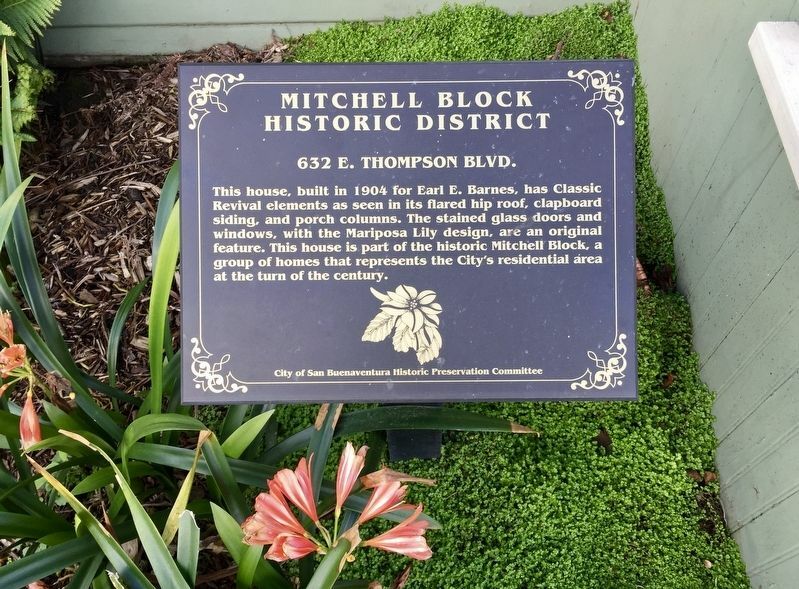 This house is part of the historic Mitchell Block, a group of homes that represents the City's residential area at the turn of the century. 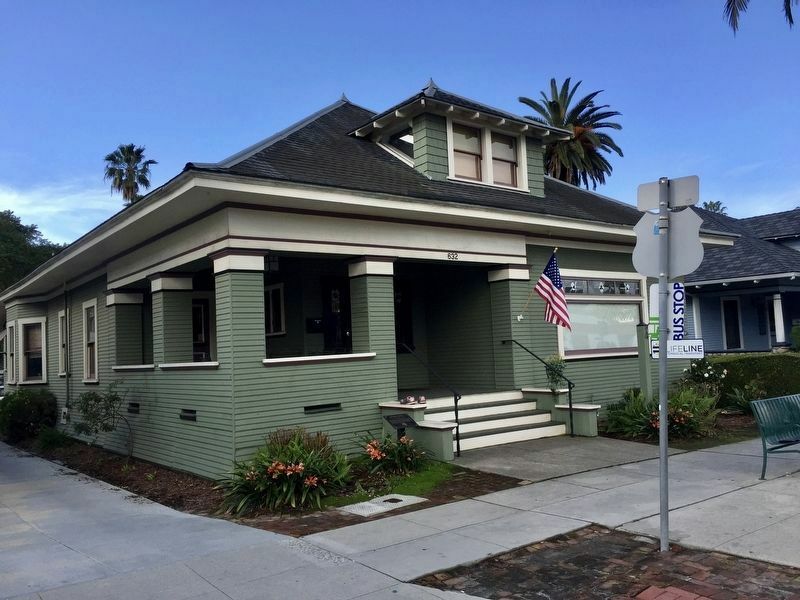 Erected by City of San Buenaventura Historic Preservation Committee. Location. 34° 16.689′ N, 119° 17.461′ W. Marker is in Ventura, California, in Ventura County. Marker is on East Thompson Boulevard. Touch for map. Marker is at or near this postal address: 632 East Thompson Boulevard, Ventura CA 93001, United States of America. Touch for directions. The marker is visible here just to the left of the steps. (approx. 0.2 miles away); The Hobart/Barr/Lucking Residence (approx. 0.2 miles away); The Hobart/Barr/Lucking Initial Residence c. 1898 (approx. 0.2 miles away); Site of the Mayfair Theater, 1941-2000 (approx. 0.2 miles away). Touch for a list and map of all markers in Ventura. More. Search the internet for 632 E. Thompson Boulevard. Credits. This page was last revised on March 18, 2019. This page originally submitted on March 18, 2019, by Andrew Ruppenstein of Sacramento, California. This page has been viewed 51 times since then. Photos: 1, 2. submitted on March 18, 2019, by Andrew Ruppenstein of Sacramento, California.